Multicultural Construction Paper, 12" x 18"
Ten creative shades for multicultural curriculums. 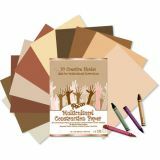 Art and craft paper reflects the rich variety of skin color found around the world. Practical all-purpose sheets with excellent strength, brightness and durability. Assorted, 10 colors. 50 sheets per pack. 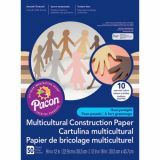 Multicultural Construction Paper, 9" x 12"
Riverside® 3D Construction Paper in a bulk pack. 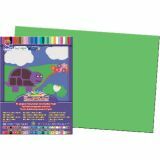 Strong sheets are perfect for construction projects, modeling or where you need a durable, rigid paper. 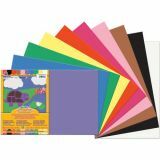 This construction paper is perfect for a wide variety of STEAM projects. Assorted colors include Black, Blue, Brown, Green, Light Blue, Orange, Pink, Red, White and Yellow. Acid-free. 100% recycled and recyclable. 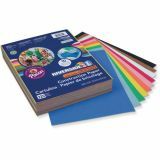 Riverside® 3D Construction Paper now available in a bulk pack. Strong sheets are perfect for construction projects, modeling or where you need a durable, rigid paper. This construction paper is perfect for a wide variety of STEAM projects. Assorted colors include Black, Blue, Brown, Green, Light Blue, Orange, Pink, Red, White and Yellow. Acid-free. 100% recycled and recyclable. This great classroom assortment of heavyweight SunWorks® Construction Paper consists of 16 packages of 9" x 12" 100 count assorted construction paper, plus four bonus packages of 12" x 18" 100 count assorted construction paper. Colors include: brown, black, white, pink, violet, holiday green, yellow, blue, scarlet and yellow-orange. 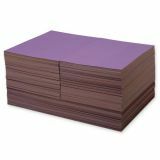 2,000 total sheets per carton. Additional shipping charges apply. 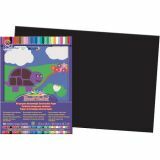 Brightly colored, all-purpose, high bulk, high strength, smooth textured heavyweight construction paper with long, strong fibers that cut clean and fold evenly without cracking. 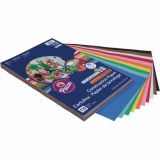 50 sheets per pack.